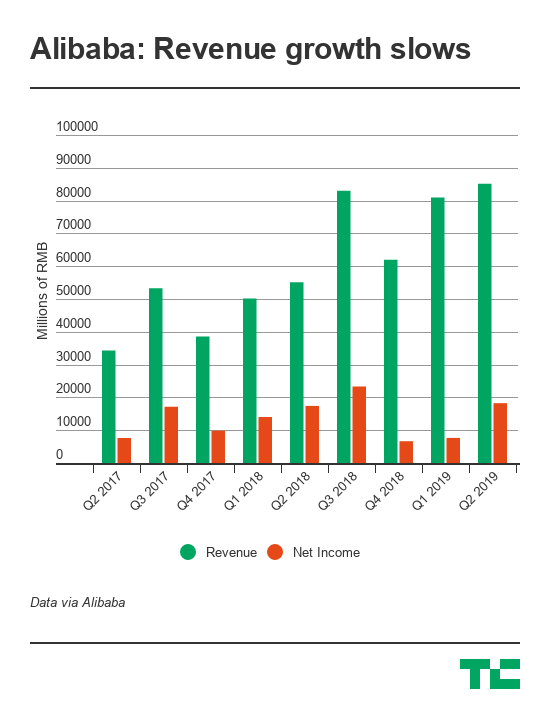 The company fell short of market expectation as it rang up RMB 85.15 billion ($12.4 billion) in revenue during Q2 2019, coming in slightly below Bloomberg’s estimate of RMB 86.58 billion. The company has also cut its forecasted annual revenue target by four to six percent — within a range of RMB 375 billion to RMB 383 billion — although it did not provide an explanation for this adjustment. Possible reasons may include China’s slowing economy, negative sentiment around the U.S. trade war and more. TechCrunch has come to understand that the e-commerce titan is testing out a new AI-driven advertising system that could create more “inventory,” i.e. advertising space, but it’s delaying monetization as its mainly small and medium-sized merchants undergo an economic slowdown. But this is far from doom and gloom — and Alibaba proudly trumpeted its results as “industry-leading,” in case you wondered. The company posted a net income of RMB 18.2 billion ($2.66 billion) for the period, which was up five percent year-over-year. Alibaba’s commerce business, its most lucrative division, grew 56 percent year-over-year to reach RMB 72.48 billion ($10.55 billion) in revenue, down from a 61 percent growth the previous quarter, but factors influencing this quarter can be found elsewhere. One major reason for the so-so financial result, Alibaba said, is that it has been investing heavily in logistics, entertainment, international expansion and neighborhood services. In August, it officially consolidated its online-to-offline (O2O) play when it merged its Koubei local services platform with Ele.me, the food delivery network it acquired in a deal that also saw Alibaba and SoftBank pump a $3 billion investment. Some other notable figures: Mobile monthly active users rose by 32 million in three months to hit 666 million, while active annual consumers (a figure that shows how many people have bought on Alibaba over the last year) went up by 25 million to reach 601 million. Shares of the e-commerce behemoth are trading up five percent in the pre-market. The company is bracing for Singles Day, an annual event that has turned into the world’s largest shopping spree since it started 10 years ago. This year will see Alibaba continue to drive growth offline with a plan to deploy retail solutions to 200,000 stores across China, while it is also putting more emphasis on expanding the festival into its international markets. In particular, that’s likely to be India, where it is an investor in Paytm; Southeast Asia, where it owns and operates Lazada; and Russia, where it recently launched a joint venture focused on e-commerce, games and social services.